A chic cane suitable for elegant everyday use, this derby handled walking stick is made from beech wood, stained navy blue. 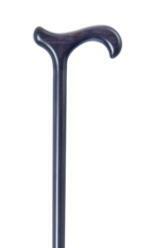 The cane is 89cm (35") long and is fitted with a discreet rubber ferrule. Ferrule diameter 19mm.